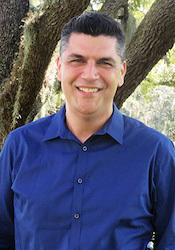 Dr. Gil Ben-Herut is an Assistant Professor in the Religious Studies Department, University of South Florida. His research interests include pre-modern religious literature in the Kannada language, South Asian bhakti (devotional) traditions, and the vernacularization of Sanskrit poetics and courtly poetry. Dr. Ben-Herut’s book Śiva’s Saints: The Origins of Devotion in Kannada according to Harihara’s Ragaḷegaḷu (Oxford University Press) is the first study in English of the earliest Śaiva hagiographies in the Kannada-speaking region, and it argues for a reconsideration of the nature and development of devotionalism associated today with the Vīraśaivas. Ben-Herut is currently co-translating selections from this hagiographical collection for a separate publication. His extensive publications include a co-translation of a twelfth-century Kannada treatise about poetics, encyclopedic entries, book chapters, and articles in the journals Religions of South Asia, International Journal of Hindu Studies, and Journal of Hindu Studies. Dr. Ben-Herut is the co-founder of the Regional Bhakti Scholars Network (RBSN), a platform for facilitating scholarly conversations about South-Asian devotional traditions.